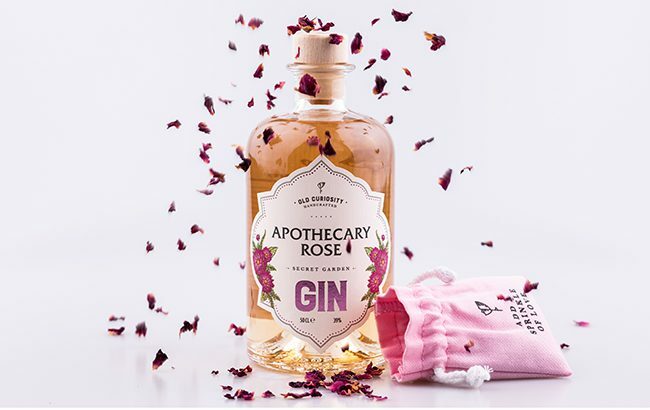 Edinburgh-based The Old Curiosity Distillery has designed a Valentine’s Day-themed gift pack for its colour-changing Apothecary Rose gin. Available from 1 February until the end of March, Old Curiosity Apothecary Rose gin will come with a free bag of handpicked pink rose petals to be used as a garnish. The Valentine’s Day pack will be available from The Old Curiosity website, as well as specialist retailers and Harvey Nichols stores in Scotland. Old Curiosity Apothecary Rose first launched in February 2018 and changes from gold to pink when mixed with tonic water. It has been bottled at 39% abv and is priced at £42 (US$54) per 500ml bottle. Other expressions within the range include Geranium and Mallow, Damask Rose, Lavender and Echinacea, and Chamomile and Cornflower. Hamish Martin, director of The Old Curiosity Distillery said: “There’s something undeniably romantic about roses, but the traditional bouquet can be a little predictable. Saying ‘I love you’ with roses and gin is much more fun.